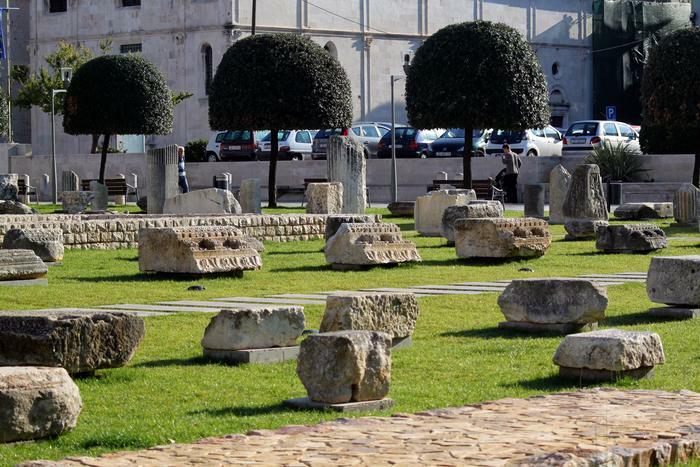 Did you know that most of the towns on the Adriatic coast were built on the foundations of ancient Roman settlements? Roman settlements in the Adriatic have had various roles, from important trading towns to private resorts, and their construction with the oval layout with rectangular streets is still recognizable. Ancient culture, due to its influence, is still causing attention among a large number of people, which is why well-preserved ancient monuments are one of the most visited tourist attractions. If you wonder what are the ancient sights you have to visit if you are spending a vacation on the Adriatic coast check out our list of top 5 suggestions. Diocletian's palace is one of the most preserved monuments of Roman architecture in the world and it is located in the very heart of Split. It was built thanks to the emperor Diocletian in 300 A.D., where he lived from the day of his abdication from the throne (305 A.D.) until his death (316 A.D.). It was built both as emperors luxury palace and as Roman army camp (castrum) and it is divided by two main streets going through the center of the palace. The southern part of the palace was meant for an emperor and his personal needs, for example, his apartments and personal temple, and the northern part was meant for his army, servants and animal stock. 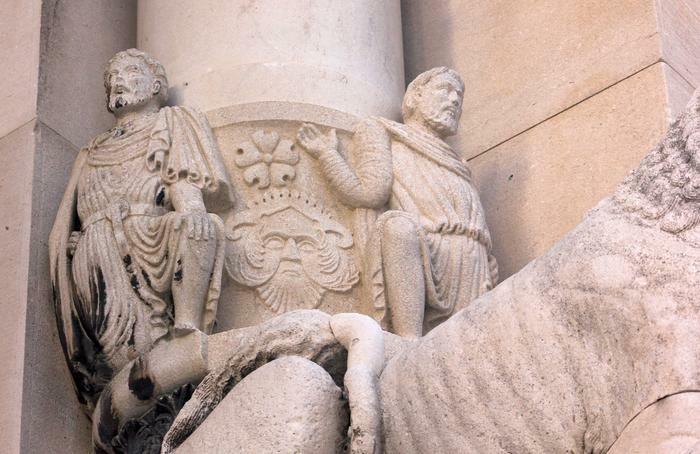 The life in the palace didn't stop with Diocletian's death, because the palace was under the ownership of the Roman court, and it was later home for the members of Roman elite families. A turning point for the palace was the settling of the Salona population after barbarians sacked the city in the 7th century. Since then, the palace became a heart of urban growth from which the city of Split (Spalato) was born. Most parts of palaces were adapted due to population activities and living within the palace, but the majority of palaces infrastructure was secured by its original outline. Diokletians palace is not just remarkable antic monument, it is also an important piece of national and world architecture. Together with its medieval and renaissance upgrades, the palace is considered an important historical and archeological site, and that is the main reason for its inclusion in the list of UNESCO-s World Heritage list. Roman ruins of Salona are located near the town of Solin, a couple of kilometers north of Split and Diocletian's palace. It is considered as a remarkable archeological gem and a fantastic site to visit for all the lovers of ancient Roman history. It was originally a port of local Illyrian tribe of Dalmatia and capital of Roman province Dalmatia. At that time it was a largely populated city with an estimated population of 60,000 inhabitants, and later during the age of tetrarchy( rule of the 4 emperors), it was known as a resort for wealthy Roman citizens. 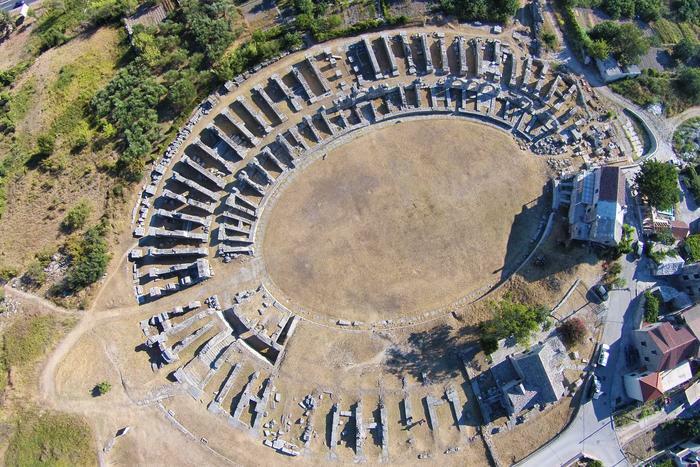 Salona is admirable for the remains of the amphitheater which was built around the 2nd century, and despite its small size, it could take around 18,000 spectators. 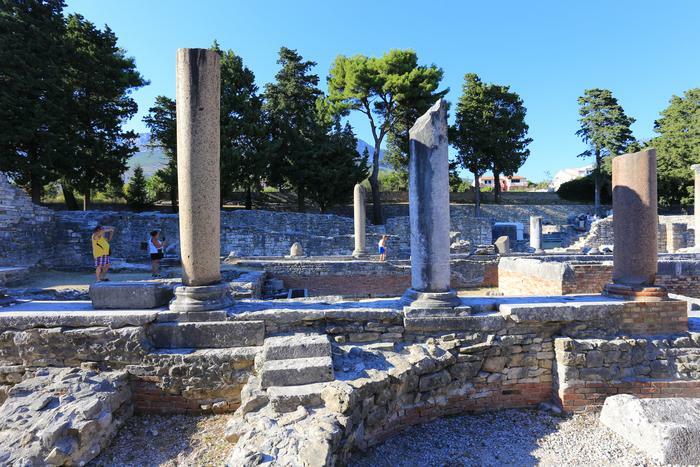 There you can also find the ruins of the Great Thermae, which is one of many significant thermal baths built in Salona somewhere around the 3rd century. 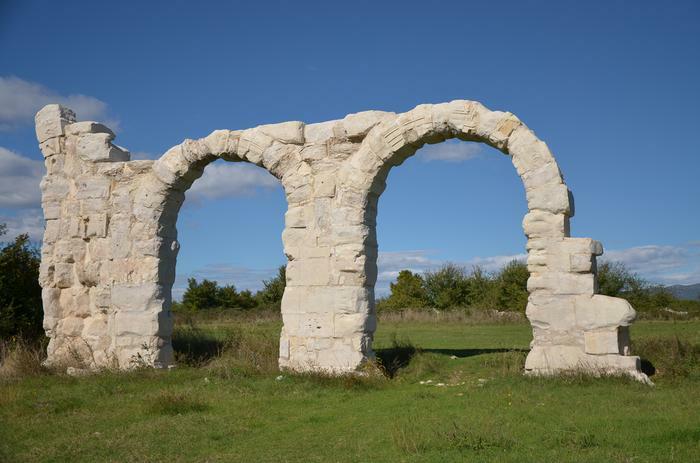 It is worth to mention that in close area 2 main aqueducts can be found, where one was built for the Salona in the first century and the second one was built for needs of Diocletian's palace in the 4th century, and both were transporting the water from the source of river Jadro. 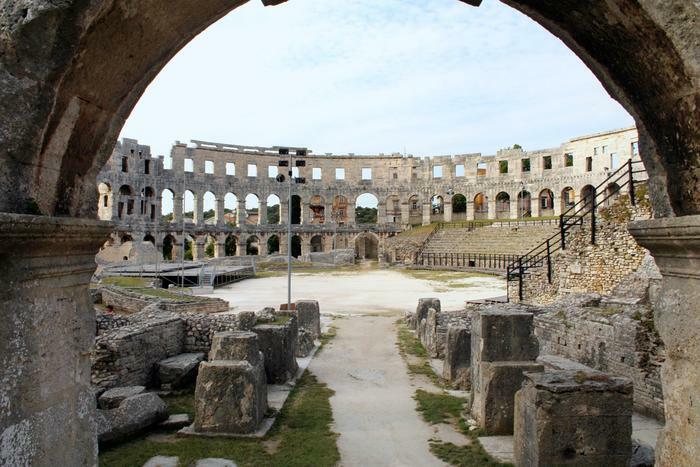 Pula (Pola) is mostly known for its magnificent Arena, which is 6th largest and one of most preserved Roman amphitheaters in the world. It is significant because it is the only Roman amphitheater with 4 side towers and 3 architectural rows completely preserved. It was built in the 1st century during the Flavian dynasty outside the old city walls and today it hosts many events such as Film Festival, Opera Season, concerts and much more. If you want to get full „bread and games” experience, then you should visit Spectacvla Anticva, the event that recreates historical Roman gladiator fights. Arena was also used for naval battle simulations, what is proven by big underground rooms which were filled with water from aqueducts. In Pula, you can also visit the Temple of Augustus which was constructed between 2nd B.C. and 14th A.D., and interesting part of it is that during the past his function changed a few times, for example, it was used for pagan ceremonies, then later during the Venetian rule it was reorganised in church, and at the beginning of the 19th century it became the museum. If you are walking in Pula, do not forget to walk through Arco dei Sergi, the triumphal arch that was originally constructed as a cities main gate in 27 B.C., but it was later reconstructed in honor of victory at Actium by the order of Lucius Sergius Lepidus, the Roman tribune who also participated in battle. Burnum was a Roman military camp, and it is located 2.5 km north of Kistanje. The building was initiated by the governor of Dalmatia Publius Cornelius Dolabella during the rule of emperor Claudius in the second half of the first century. The site includes remains of many room complex and a small amphitheater, but it is mostly known for its 32 km long aqueduct, which is entirely underground. The site is still under the process of archeological explore and reconstruction, but there is also a possibility to visit Burnum museum where you can see exhibits from the amphitheater and other parts of the archeological site. In the city of Zadar (Iadera), in the nearby area of the church of Saint Donat, you can find the remains of Roman forum, which started with construction during the rule of emperor Augustus and was finished one century later. It consisted of the high capitol, temples dedicated to Jupiter, Juno and Minerva with many columns and stone carving dedicated to Roman gods. One of the pillars was used in the medieval century as a „Pillar of shame”, where the convicts were chained and humiliated by the near walking citizens.